Most people, including those in Scotland, think England should have its own parliament, a BBC poll suggests. Newsnight found 61% in England, 51% in Scotland and 48% in Wales agreed with the idea. The poll, carried out to mark 300 years since the Act of Union, was of 883 adults in England, 543 in Scotland and 527 in Wales. Independence is expected to be a key issue in the Scottish Parliament elections in May. 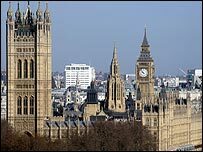 Steve Uncles of the English Democrats, a group campaigning for an English parliament, told the BBC: "When something has this much momentum, there's only one way things can go. "The current situation is unfair and English people, who have a sense of fair play, want a change." More people in Scotland wanted the Union to remain rather than break up, Newsnight found. However, only 17% of Scots and 20% of Welsh thought that the Union would continue for another 300 years. Nearly a quarter - 23% - of those in England also thought it would be in place for that long. Scottish National Party leader Alex Salmond said the Scottish people should have a referendum on independence. He told BBC Radio 4's Today programme: "There's far more support for independence than there's ever been." He added: "People feel far more Scottish than British." I strongly support home rule for England. If the only way to achieve this is for us to separate then so be it. Mr Salmond said that, if independence was gained, Scotland would keep the pound in the short term, before adopting the euro. He also accused the government of presiding over slow economic growth - 1.9% a year - in contrast with that for other small northern European nations, such as Ireland, Iceland and Norway. But Transport Secretary Douglas Alexander, who is running Labour's campaign for the Scottish election, said: "The great outcome of devolution is it allows people to demonstrate their identity within the United Kingdom and, at the same time, not break up the United Kingdom." Scottish identity was not "one-dimensional", he added, while there were "serious questions" to be asked about the affordability of independence. Half of all those questioned by Newsnight thought the Union had less than a century to go - in England 49%, in Scotland 51% and in Wales 50%. There was a division over whether there would be economic benefits if the three countries split. In England, nearly a quarter - 24% - thought they would lose out and another quarter (25%) thought they would benefit. Another 44% thought it would make no difference. Many more people in Scotland thought they would do worse out of separation (37%), while 31% though they would be better off. The poll also found that 73% of people in England and 56% of those in Scotland wanted things to remain the way they were. In Wales, 49% thought they would be worse off if the Union dissolved. Only 14% thought they would gain. The Newsnight poll, carried out by Opinion Research Business, came after recent fresh calls for England to have its own Parliament. In October, an architect of Scottish devolution said it was a "sovereign right". Canon Kenyon Wright said it was "undemocratic" that Scottish MPs could vote on England-only issues but not vice versa. He said he wanted to see "a strong English Parliament" and a strengthened Welsh legislature. Opponents say they fear the break-up of the United Kingdom. The English polled believed the end of the Union would make no difference to them (76%), with only 11% believing it would enhance English culture. Jeremy Paxman and Kirsty Wark will host a BBC Newsnight debate on an Act of Disunion on BBC Two at 2230 GMT on Tuesday.